The Parish Church is picturesquely sited in the village of Groomsport, overlooking the sea. It holds a special place in the history of Northern Ireland’s rural architecture. The “Chapel of Ease”, as it was when built in 1841, was one of sixteen churches built with funds supplied by the Church Accommodation Society, started by Bishop Richard Mant. The site in Groomsport was a gift from Mr John Waring Maxwell of Finnebrogue, near Downpatrick. His summer residence was the nearby Groomsport House. The architect was the famous designer Sir Charles Lanyon, architect of the then Queen’s College (which later became Queen’s University), who gave his services free to the Society. The first service was held on December 11th 1842. For some unknown reason, the Church was not Consecrated until February 2nd 1850. The Parish comprises 3,252 acres – see Boundary map below. 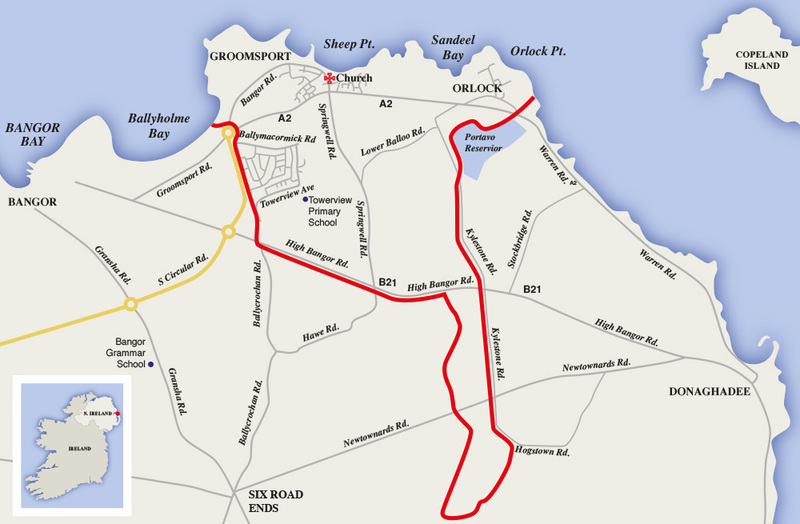 It begins at Ballymaconnell Road, Bangor, passes along the coast, taking in the Townlands of Ballymacormick, Groomsport, Lower Balloo, Ballyminetra, Orlock, Portavoe, and, crossing the B21 Bangor-Donaghadee Road, takes in Ballyfotherly. It also includes the Copeland Islands. When J W Maxwell gifted the site, it was on condition that “burials are expressly prohibited either in the Church or the Churchyard”. Another condition imposed was “That the Church shall be called Groomsport Church”. It seemed that if at any time in the future, the Rector and the Select Vestry wished to call the Church after a Saint, there would be difficulty in so doing. The Church, as designed by Lanyon, was initially built with a Nave only, and with an Entrance Porch in the base of the Tower. It had seating for one hundred and thirty parishioners. In 1909 the Chancel was added in memory of Major Robert Percival Maxwell. On that occasion, additional pews were installed and the flat ceiling was replaced by the present hammer-beam roof. The West window, which was designed by Mayer of Munich, was installed in memory of Robert and his brother John William Percival Maxwell who had died in 1873 and 1875 respectively. The total cost of the building in 1841 was £750. Half of this sum was given by the Church Accommodation Society, along with a generous donation and an endowment of £100 per year from Mr J W Maxwell, with the balance falling to the building fund. At this time a Church Bell was given as a gift. It bore the inscription ‘Presented by Mr J W Maxwell, Esq R E of Finnebrogue, to Groomsport Church. Thomas Mears, Foundry London 1843’. A copy of the receipt for this bell is shown in the photos on this page. A Church plate was also presented as a gift from Lady Selina Ker of Portavoe, a daughter of the first Marquis of Londonderry, and a half-sister of Viscount Castlereagh. In 1932 when the Transepts, designed by local architect JA Hanna, were consecrated, Lady Selina’s Grandson, Major D A Ker of Portavoe was the People’s Churchwarden. 1968 -1975: James Edward Moore. Circa 1920. The Spires have been removed at this stage. C.D.Patterson; The parish Church Groomsport, 1842-1934. The Reverend Abraham H. McCausland, Rector of Groomsport 1853-1880. In the photo of the first wedding in 1865, the older of the two men sitting, is John Waring Maxwell, our founder and Grandfather of the Bride. The other man seated, is the Groom. There is a possibility that it is the Maxwell/Perceval wedding. However it is a large wedding and therefore significant. The setting for the photograph is the lawn in front of Groomsport House, with the Parish Church in the background. A drawing of Groomsport Church in its original form, showing the Spires. The Bell in Groomsport has an important history. It was cast by Thomas Mears and Son in 1843. This company is the oldest manufacturing company in Britain. After George Mears died, it became known as Whitechapel Bells , a famous company, as it cast the bell for Big Ben and also the Liberty Bell in Philadelphia. The Bell was delivered to Bangor Castle. A copy of the original receipt can be seen below. As mentioned above, the window in the Chancel facing West, was made by Mayer of Munich. It features the Transfiguration. The window in the South Transept includes the arms of the Percival Maxwell family and in the North Transept, the arms of the united dioceses of Down and Dromore can be seen. The Good Shepherd window in the Nave, designed by the eminent Irish stained glass artist Kitty O’Brien, was installed in memory of Montague Gordon Weaving in 1959. The two windows in the South West Transept, made by Whitefriars of London, to a design by Denis O’D Hanna, are memorials to members of the Perceval-Maxwell family. Advent Sunday 2017, was a significant day in the life and history of Groomsport Parish as the congregation and guests celebrated the 175th anniversary of the building of the Church. The 175th celebrations brought together the great, great, great grandson of Robert Perceval–Maxwell, Bill, and his cousin Norrys, as well as a previous Rector, Canon Derek Tyney and his wife Gwen. Also at the service of celebration and the Parish Lunch was Patrick Freeman, the son of another previous Rector, Revd George Freeman who died suddenly in 1944, and Mary Moore, the widow of Bishop Jimmy Moore who was Rector of Groomsport from 1969 to 1975. The congregation was delighted to welcome the Archbishop of Armagh, the Most Revd Dr Richard Clarke who preached at morning worship. The Parish is marking this significant milestone by undertaking a major programme of refurbishment in 2018, work that is supported by the Heritage Lottery Fund. It is hoped that this work will enhance this lovely little gem of a Parish Church, and that the ministry of the Church will carry on for another 175 years! L–R: Patrick Freeman, Bill Perceval–Maxwell, Helen Parkinson (Peoples’ Warden), Revd Faith Cully (Assisting Priest) The Archbishop of Armagh, the Most Revd Dr Richard Clarke, Revd Duncan Pollock (Rector) Norrys Perceval–Maxwell, Lady Sylvia Hermon (MP for North Down), Gwen Tyney, Canon Derek Tyney, Hester Kelly (Rector’s Warden). As published on the Down and Dromore Diocesan website 5 December 2017. Use the slider to view the before and after photo. Groomsport Parish Church is a unique building, in a number of ways. It was designed by Sir Charles Lanyon to the instructions of Colonel the Hon. John Waring Maxwell MP of Finnebrogue, Downpatrick and owner of Groomsport House. Built in 1842 it has evolved into a building which is unique in these Islands, what amounts to a miniature cathedral. The building is also different in that it faces west where other churches in the episcopal tradition face east. It furthermore houses a collection of stained glass which would grace a very much larger church building. It all began in October 2015 when our architect, Ken Best produced a PP presentation on how we might proceed to breathe new life into our old, damp, battered, unique, beautiful and much loved Church building. The General and Select Vestries were unanimous: it had to be done for the sake of the Parish, Groomsport, Ulster’s heritage and above all our Christian faith. During its 175 years of life Groomsport Parish Church had been extended several times but had not received an overall refit until now. Some repair works had been carried out in the last fifty years but the fabric was now in serious need of attention. By dint of careful and skilful financial management together with the generous support of parishioners and friends and a substantial grant from the Heritage Lottery Fund we have been able to finance a full external and internal refurbishment for which our Chief Contractor was East Down Construction Ltd. Over the last seven months the entire roof has been replaced, stonework has been repaired or replaced, windows refurbished and all water goods replaced in keeping with the original. Internally, the walls have been damp proofed, the old heating pipes replaced with a modern gas-fired underfloor system, the Church has been entirely re-wired and an appropriate lighting system installed. Finally, after complete redecoration, we have replaced the old pipe organ, which was of no historic significance, with a new digital 3-manual instrument supplied by Viscount Classical Organs of Bicester, Oxfordshire. From the beginning we were determined to maintain the sanctity, ethos and beauty of Groomsport Parish Church. This we have done: there are no big screens! A very special Service of Thanksgiving and Re-dedication took place in Groomport Parish Church on Sunday 2 December, Advent Sunday 2018. The service was led by our Rector, Rev Duncan Pollock and the special guest was The Right Reverend Harold Millar, Bishop of Down and Dromore. Other guests included Lady Hermon, our MP, Councillor Eddy Thompson, Deputy Mayor, local clergy, councillors, and other dignitaries. Bishop Harold in his address, commented on the full church, and gave thanks to the Rector, the Select Vestry and everyone involved in bringing Groomsport Parish to such an encouraging place. The Bishop recognised the number of ways in which our church has grown in recent years. The Service was a celebration of our return to worship in the beautiful village church after six months of extensive building work which included a new roof, major structural stone work, rewiring, and installing a new heating system. A much needed new Three Manual organ was also installed. It was a fundamental requirement of the Project Team that the Church, which had been originally designed by Sir Charles Lanyon, should retain its traditional village ethos and sanctity whilst being secured and restored as a building fit for future generations. Some of the greatest compliments paid by members of the congregation and visitors on entering the church when it re-opened, were to the effect that the ‘gracious and spiritual atmosphere of the church had been retained’. Much credit for this work is due to the Conservation Architect, Ken Best, East Down Construction, and Barry Greenaway, a member of our Church who worked so hard as Project Manager. Sincere appreciation also goes to the Heritage Lottery Fund for providing significant funding of over £140,000, which supplemented the £200, 000 raised by the parishioners. A new banner was presented as a symbol of thanks for the ministry of Groomsport Church and Parish over a period of one hundred and seventy five years. The beautiful banner had been hand-made by one of our Vestry members Kate Murray, along with Susan McNair and Eppie Bates. Bishop Harold, in his re-dedication address noted that whilst many churches are shrinking, Groomsport is one which is growing. Indeed, in observing that like Willowfield Parish, we are one of the few churches in the Diocese that is not named after a Saint, the Bishop suggested that it might be something which we as a Parish should consider for the future. In his closing remarks our Rector extended thanks to the many members of the congregation and local community who have faithfully supported the work of the Parish over the recent restorative period. At the end of the Service, Heather Pentland, Secretary of the Select Vestry paid tribute, on behalf of the Select Vestry, to the Rector, and to the way in which he has reinvigorated the Church, its congregation and its place in the Community. Quoting from comments made by members of the congregation, she related how our Church, as a united family, has never been closer. People are drawn to the Church by the humanity, the deep pastoral care and the approachability which Duncan demonstrates. He relates as easily to the very young as to the elderly. The Sunday school is growing and the congregation have been empowered to participate and share in the development and outreach of the church. Something special is taking place in Groomsport Parish when people travel many miles to worship because of the quality of fellowship which they experience. On behalf of the Select Vestry, Heather and Helen, the Rector’s Warden, presented the Rector with a specially commissioned painting of the refurbished building by local artist Adrain Margey. Each member of the congregation, on moving out of the Church, towards the Church Hall for lunch, was provided with a lovingly prepared bag of ‘goodies’ including a beautiful Calendar depicting aspects of the Restored Church, a book mark, key ring, and prayer card all as gentle reminders of a very significant day in the life of Groomsport Parish.